I love my grains, but I also love my non-grains. Being a Celiac and just a crazy foodie (one that loves potatoes and plantains like no other), I live for all the grain-free starches and carbohydrates out there. For dinner, I am 90% of the time having a non-grain starch. Growing up, I really only ever had potatoes and sweet potatoes as my non-grains, but once I started diving into my passion for cooking and finding every fun way to make gluten-free (allergy-free) living amazing, I began trying everything I could get my hands on. Hold on! Don’t put your grills away just yet! Who really says grilling ends after Labor Day? That’s absurd and I have a recipe that needs to be shared and requires a grill. It I still had access to my wonderful gas grill right now, I would still be out there everyday. Alas, I sadly don’t. Grilling was so much fun and I can’t wait to get to do it again when I go home. Until then, I’ll just let you do the grilling for me and gaze at the pictures of these delicious gems. That’s right, Grilled Plantains! Baking plantains was fun, but grilling is the new way to go. This way you can achieve the ultimate smokey taste. The flavor from the grill, plus that perfect smokey taste from my second favorite spice…smoked paprika! What’s sad though is I’ve only had one plantain in the last 3 weeks. The one sad plantain I brought down to college with me. I’ve seen plantains at the Safeway down the road from my campus, but they were all not up to plantain par. Hopefully they will get some good ones soon. Man how I miss my starchy smokey plantains :/ Grilled or not! + Peel and cut your plantain into thin slices. + Toss plantains with spices until evenly coated. + Lightly oil a piece of foil and spread your plantains out on it. Place the sheet on a grill over high heat. + Close the cover to the grill and cook for 6-7 minutes. Flip the plantains and cook for another 6-7 minutes, checking to make sure they don’t burn. Gosh, I really want a plantain right now. This week I will be on the lookout! I need to satisfy this craving! I did find some good parsnips to roast though. But they won’t satisfy that plantain craving very much. So I guess this is my request from you. If you happen across some beautiful green plantains, please send them my way 😉 I will be forever grateful! I wonder if I can grow a plantain tree…outside my dorm… However, I think the approaching winter season might now allow it to thrive to well. In my dreams I guess. I’ll be counting plantains (and potatoes). But really, grill one last plantain for me and tell me how good it was before you put that grill away! 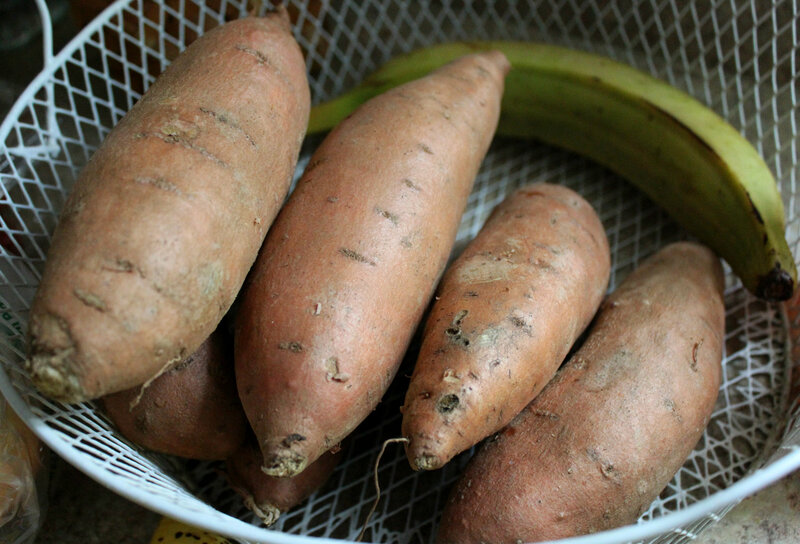 + If you had to choose between a plantain and a sweet potato (of the Japanese/White/ or Purple variety), which would you choose? I’m going to abstain from choosing 100%. That’s so hard! But I think maybe if I could have a perfect Stokes PSP right now, I would be pretty happy. + Are you still grilling or do you stop this “seasonal” activity when the cold weather comes? At least it isn’t cold yet! O, the Sweet Potato. So simple and unassuming on the outside, but cut it open and you will find the orangey bliss and wonder that this spud has to offer. 1. Contains high levels of Vitamin B6. B6 is known to reduce cardiovascular disease risk, certain cancers, as well as increase cognitive function. 2. Great (non-acidic) source of Vitamin C. Of course Vitamin C helps our immune systems and can shorten the duration of colds and illness. But it also plays a huge part in collagen production, wound healing, and keeping our bones strong. Not to mention it is also a cancer-risk reducer. 3. They contain Vitamin D. Vitamin D helps our bodies absorb calcium so our bones can be strong unbreakable fortresses (Vitamin C helps us absorb Vitamin D). D also supports our immune system, keeps our energy up and mood levels stable, all while helping our thyroid work properly. 5. It has that great mineral Magnesium. Magnesium is extremely important in promoting relaxation stress-reduction. It is also necessary for healthy artery, blood, bone, heart, muscle, and nerve function. Up to 80% of us are deficient in this mineral so start stocking up on your orange spuds! 6. They are loaded with Potassium. Step aside Bananas. Potassium is an electrolytes that helps regulate heartbeat and nerve signals. as well as other functions such as relaxing muscle contractions, reducing swelling, and protecting and controlling the activity of the kidneys. 7. They are orange. We all know we should eat from all colors of the rainbow, and orange is no exception. Having this beautiful color allows them to be high in carotenoids like beta carotene, which is the supports vitamin A in your body. Carotenoids help strengthen our eyesight and boost our immunity to disease, they are powerful antioxidants that help ward off cancer and protect against the effects of aging. 8. They are one healthy happy carbohydrate. Toss those refined processed grains our the door and get your carbs from this great source. They have a low-GI so their naturals sugars are released very slowly and give us sustained energy. 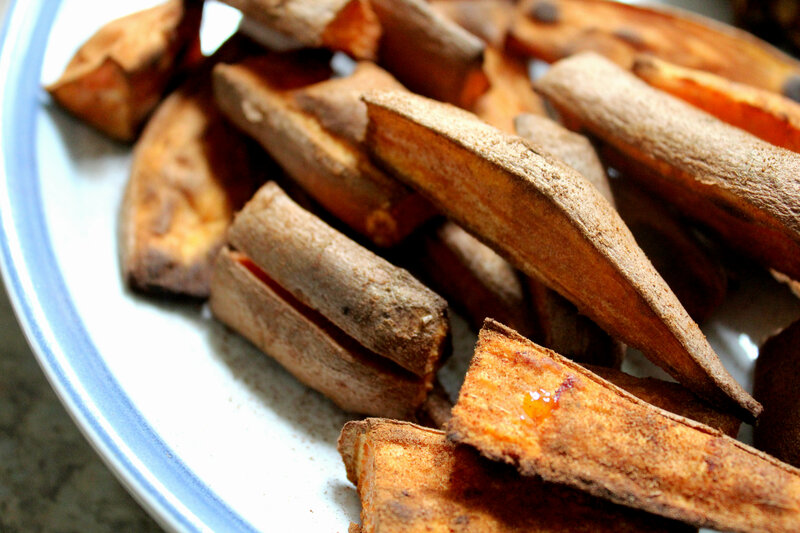 With all of these benefits, what is there not to love about the sweet potato. Even if you have never had one you can already see what you have been missing out on. But now we get to the even better part. Taste! I adore sweet potatoes and eat them year round and always have a huge basket full at home. 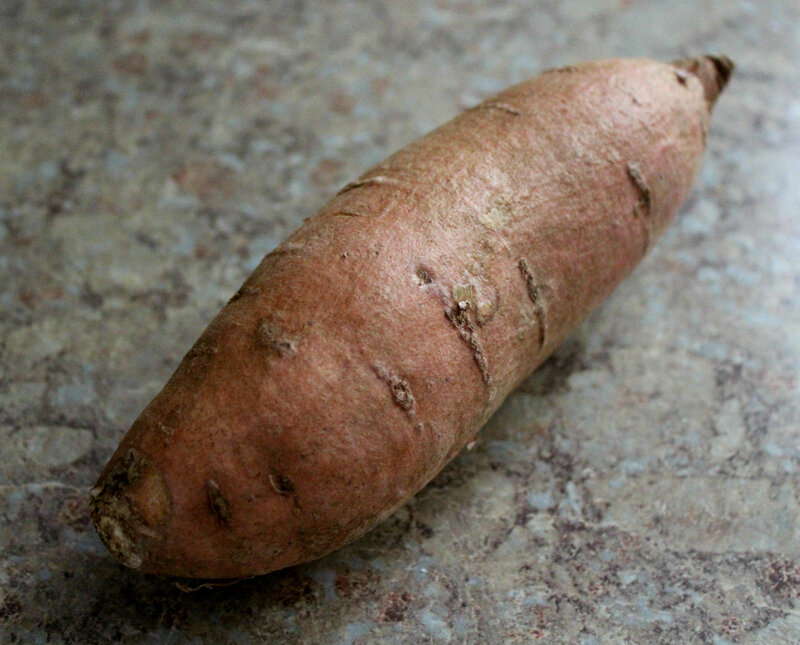 There are so many uses for sweet potatoes so I will just name the basics: Mashed sweet potatoes, sweet potatoes in a smoothie, grilled, baked in the oven, “baked” in the microwave, cut in to disks or fries and baked in the oven, sauteed for a salad, or stuffed and loaded for a delicious easy meal. My favorites are micro-baked (just made that word up) or cut into fries and tossed the oven. O, and don’t ever for get the cinnamon! – Cinnamon! Or what ever spices you want your fries to be flavored with. – Preheat the oven to 450°F. Wash your potato and dry it off. – Next, cut your potato length wise them cut strips in each half, then cut those strips in half. You could also cut your potato in to rounds. Either way they will come out perfect! – Foil and lightly oil a baking sheet and place your fries on it. Then load on your spices and toss and coat the fries with your hands. – Toppings! My go-to’s are cinnamon (obviously), pumpkin pie spice (i.e. cinnamon, ginger, allspice, cloves, nutmeg), hemp (hearts)/seeds, unsweetened coconut flakes, sunflower seeds, pumpkin seeds, or even some nut butter! – Wash your potato and dry thoroughly with a paper towel. Stab a few holes in the potato with a fork or knife. Then place the potato on top of the slightly damp paper towel and place it in the microwave. – I use the potato bottom on my microwave which cooks it for 4 minutes on high. Then I flip it over and cook it again for 4 minutes on high. The Potato should be done now (slightly shriveled and very soft), if not just go through the cycle again for the appropriate amount of time. – Take the potato out, (it’s very hot so be careful), and place it on a plate, cut it open (I also usually cut the end tips off) and get crazy with toppings! If you ever don’t feel like cooking sweet potatoes are such a quick and easy side dish (or main dish). They have saved me so many times when I have been in a rush, just pop it in the microwave and BAM! Perfection. Since it is Wednesday, remember to link up you favorite or recent eats to Jen’s WIAW! 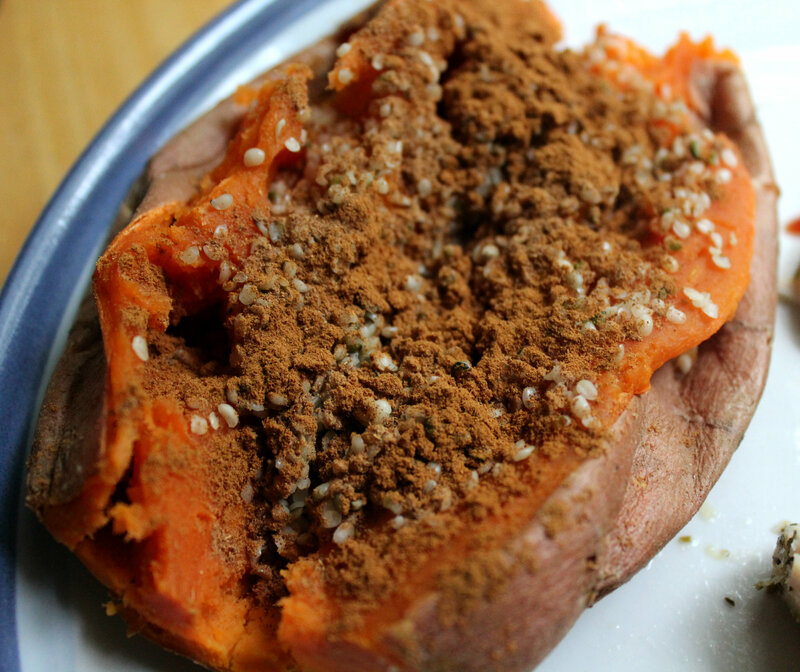 What is your favorite way to eat a sweet potato? What is your go to carb/starch of choice when you are in a rush for dinner?